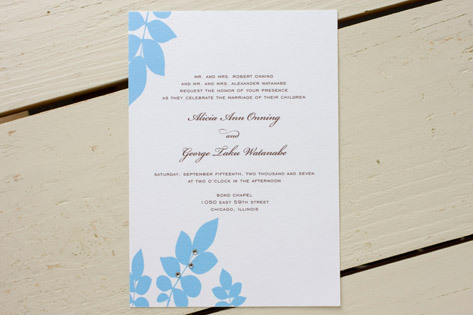 Stylized leaves, studded with sparkly crystals, embellish this bold, elegant wedding invitation. A smaller version of the leaf motif is echoed on the invitation envelope, and coordinating items from the invitation suite tie together this collection. Available in cerulean/chocolate (shown), coral/black, aubergine/chocolate, and taupe/coral.